Mashable writer Amy-Mae Elliott recently posted articles “Google+ Tips & Tricks: 10 Hints for New Users” and “Google+ Tips & Tricks: 10 More Ways To Make the Most of Your Account.” I found them both very helpful in navigating and best utilizing this new social media tool. Earlier this week, I posted some tips for news users here. Today’s post will focus on some more ways to utilize Google+. 1. Check Your “Added to Circle” Notifications – Amy-Mae suggests reviewing the “People who’ve added you” view every once in a while so that you don’t miss anything important. I just did this myself and added 10 more acquaintances to my Google+ friends. 2. Filter Your Notifications – Your notifications view can seem a bit cluttered, so Amy-Mae suggests organizing and filtering through these by clicking the “More” drop-down option at the top right corner of your screen and weeding through the different notifications. 3. 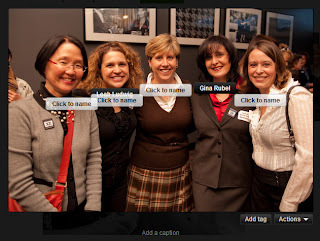 Select the Correct Thumbnail – When adding a link to a post, Google+ doesn’t always capture the correct thumbnail. Double check before sharing your post. If it’s not the correct thumbnail, then use the arrows that appear in the top left corner of the thumbnail image to scroll through them. “X” removes the thumbnail entirely. 4. Save Time with Notifications Toolbar Icons – This icon can serve you well. It lives in the very top right corner of your screen right next to your name (in a black toolbar that extends across your entire screen). By simply clicking on this toolbar icon, you can review all of your notifications quickly. 5. Tag People in Photos – To do this, open the photo in the lightbox viewing mode. Go to your “Photos” tab, select the album that you would like to edit and then click on the photo to which you would like to add tags. The photo will show in lightbox view and there will be an option at the bottom of the photo to add tags. 6. Enable High-Res Video Chat – This is an option available for the Google+ user. To enable the feature, go to the “Chat” drop-down menu and select “Settings.” Then check the “Enable high-res video” chat box. This feature is the same as Gmail’s video chat offering. 7. Lock Down the Dimension of Your Profile Pic – Google+ accepts 200 pixel by 200 pixel-sized images for your profile pic. Therefore, before uploading a huge image or a small image that needs to be enlarged, resize your profile image to 200 by 200 pixels and make your profile picture look professional and stand out. 8. Display Your +1’s – Google+’s default setting does not show the +1 items that you have liked on your profile. To show these, go to your “Profile” tab, click “Edit Profile,” and then click on the “+1’s” tab. You will then see an option to “Show this tab on your profile” and bingo! 9. View Your “Nearby” Stream on a Computer – Amy-Mae describes the “Nearby” functionality which allows you to view public posts in your vicinity, as one of the most popular features of the Plus Mobile app. The URL for the mobile version of Google+ is https://m.google.com/app/plus/. 10. Send Invites Without an Email Address – You do not need a friend’s email address to invite them to join the Google+ conversation. You can reach out to your Facebook and Twitter friends by choosing the “send invitations” tab which is on the right hand side of your screen – and invite away.